▷ Sunmile SM-G50 Review 2018 » Best Stainless Steal Meat Grinder? Whether you are a professional chef or just someone looking to grind some meat at home, you will need a high-quality machine for the job. The SM-G50 is an inexpensive option that knows a lot. 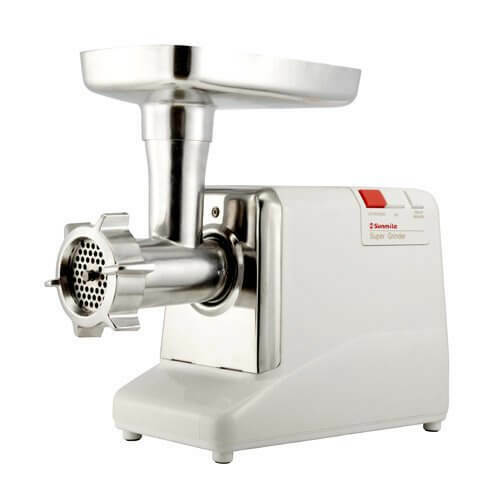 The Sunmile SM G50 meat grinder is a high-quality kitchen appliance designed for making meat grinding an ease. If you are tired of dealing with large and dirty meat grinders, then the products of Sunmile Industries will be your favorite. It is a small and compact grinder. Its lightweight is perfect for home kitchens and it can be stored easily. With a powerful 350 to 1000 W motor, this appliance can grind large amounts of meat very at the rate of 200 lbs per hour. This grinder is considered to be one of the faster grinder models out there. It can also grind chicken bones and other lighter bones as well. I find this convenient for both house kitchens and smaller restaurants. Besides all the accessories mentioned above, the machine has many great features. A highly convenient four operations switch feature might be the greatest safety measure of all meat grinder models. Most of the models only have the on and off functions on the switch while the Sunmile SM G50 has on/ off/ reverse and reset operations. Reverse operation will empty the whole machine and prevent any meat being stuck inside. The on/ off and reset functions give you complete control over the grinding process. It also has a built in circuit breaker which is a great safety addition. It stops the process in case of any power issues to prevent damage. All the accessories included in the set are aluminum and steel which calls for durability and extended use. The die-cast aluminum hopper, head and cutting plates are of a very high quality. However, some parts are plastic such as the food pusher and the sausage attachment. This does not mean they are considered bad quality; they still function properly and can be used for a long time if they are stored and saved from damage. The appliance is ready for use right out of the box. All the necessary accessories for meat grinding are included so you won’t need to spend additional money. The aluminum tube and screw are detachable allowing easy cleanup. The unit has a built-in storage for the cord as well as for all the accessories. This is another convenient feature because you won’t need extra space to store all the things that come with it. Even though all the parts are detachable and therefore are dishwasher safe, I would not recommend this cleaning method. Washing the parts in a dishwasher will cause rusting and speed up that process overall. By avoiding it, you can extend the use of the machine and still be able to clean it pretty easily. Simply detach all parts and wash them in soap and hot water. Make sure all the meat residue is gone and leave the parts to dry out. Another not so good thing is the fact that, even though it is very durable, this machine is not made for frequent, everyday grinding. 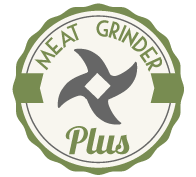 If you are planning to grind larger amounts of meat every day, you might want to go for a more industrial grinder. However, the Sunmile SM G50 is perfect for home use. The best thing about this meat grinder is the affordable price. For the durability and the high quality it offers, this is possibly one of the best-priced meat grinder on the market. Customers love it because it is easy to use, compact and easily stored and does the job very well. The built-in storage for cords and accessories is a perfect addition to the unit. You won’t need to find extra space for things and you will never lose them in your kitchen. I think the Sunmile SM G50 is a great and affordable option if you want to be able to grind meat at home. It’s high quality and simplicity are suitable for everyone.